The LVH-200 series has been discontinued. Please see the LVN90 as a possible alternative or contact our Flow Engineering department. The OMEGA™ LVH-200 single station horizontal level switch is cost effective for level control applications in small tanks where it is more convenient to install a level switch through the sidewall of the tank. When the float arm is raised to the switch housing, the switch is activated. As the float drops away from the housing, it is deactivated. 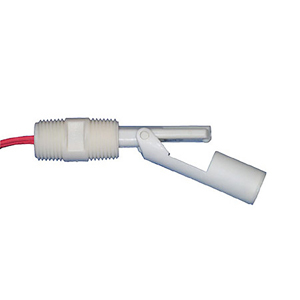 The movement of the float brings the imbedded magnet into close proximity to the encapsulated reed switch, causing it to actuate. The contact function may be selected as either normally open or normally closed. When triggering inductive or capacitive loads, use the LVH-200 with external solid state relays.